SD UNIFIED TO FEDS: THANKS, BUT NO "TANKS"
September 19, 2014 (San Diego)—You won’t be seeing an armored vehicle on San Diego Unified School District campuses after all. 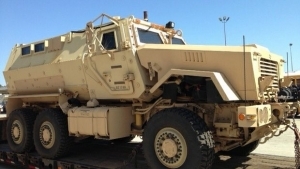 The District has decided to return a Mine Resistant Ambush Protected Vehicle, or MRAP, that had been donated by the U.S. Department of Defense. Read more about SD UNIFIED TO FEDS: THANKS, BUT NO "TANKS"